Not too much to say about take away fish and chips from Colmans (Ocean Road, South Shields), other than, it was amazing. 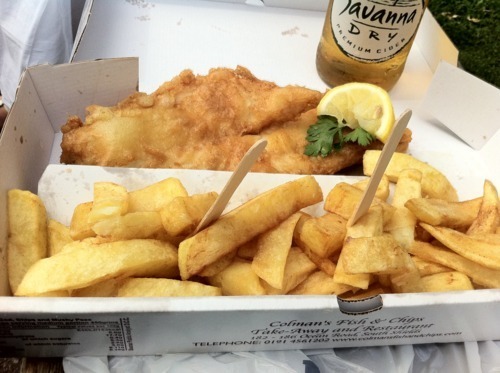 While £5.90 is the most I’ve ever paid for takeaway fish & chips – it was worth every penny. The portion size emphasizes quality over quantity, and it shows – fresh sustainably sourced and locally caught fish wrapped in super light and crispy batter. Chips with that perfect blend of fluffy inside and crispy outer layer didn’t even require the usual dousing with salt and a litre of vinegar. Having the confidence to serve with a slice of lemon and sprig of parsley, and even printing nutritional information on the box shows these guys know what they are doing. Also caught in picture – Savanna dry cider – an unusually brilliant accompaniment to a seaside classic – definitely give it a try! Will be back sooner rather than later for a sit in meal and a fuller review. Superb.